Would you like to know a little more about Anne McEntegart? Anne McEntegart (nee Patmore) was born in Edinburgh in 1905, the youngest of four children. When Anne was two her parents separated and her mother took the four children to Liverpool where they lived close to Anne’s maternal grandparents. In Anne’s teens her mother and the four children moved from Liverpool to The Brae, Crocketford in Dumfriesshire. Anne was educated at Cheltenham Ladies’ College and studied book illustration at Edinburgh College of Art. Before her marriage she was engaged in advertising work in London. She also illustrated two books by her sister, Vera. After Anne’s marriage in 1931 to Squadron Leader Bernard McEntegart, Anne lived in Malaya where she illustrated some English Readers for Malayan children and a Malayan cookery book. She learnt to sculpt. Their only son was born in 1932. After they returned to England in 1934 Anne was committed to supporting her husband in his Royal Air Force duties and to looking after their son. 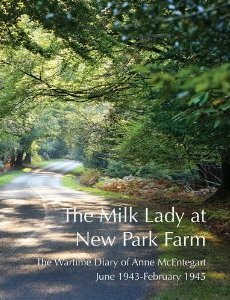 Anne worked on a farm in the New Forest from June 1943 to February 1945 - it was her choice to support the War Effort. Their son had been evacuated to Newfoundland. When Air-Vice Marshal McEntegart was invalided out of the Royal Air Force they bought a farmhouse twelve miles from Dumfries, near Dunscore. After her husband’s death in 1954, then her son’s tragic training accident in 1955, Anne went to live in Paris. There she illustrated a series of Readers. She continued to paint in oil and watercolour, worked in pastel, and learnt to make engravings. She travelled extensively in Europe, painting and fulfilling a number of commercial commissions. She always came back to her home near Dunscore and in 1965, returned there permanently. A selection of her artwork is now in Dumfries Museum. In 1979 Anne moved to Appleby-in-Westmorland. She continued to paint and started sculpting again. She died in 1984. She was a modest but committed artist. In 1986 a Retrospective Exhibition of her work was shown at Abbot Hall Art Gallery, Kendal; The Gracefield Arts Centre, Dumfries; and The McLaurin Art Gallery, Ayr. For further details and to view Anne's work click here.